The PL3000 system is used on building sites to make concrete foundations for the construction industry. It controls and monitors the drilling (with augers) and filling of concrete piles used to form a solid base on which to build. It consists of a custom touch screen PC computer located in an auger-piling rig running PL3000 Auger monitoring software. 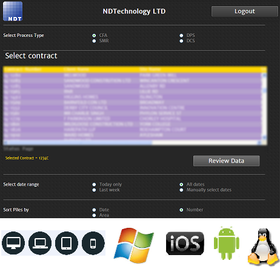 Software is written and maintained for N.D. Technology by MEV Ltd. The PL3000 software monitors pile construction using an array of sensors attached to the rig. The PL3000 software communicates with a cloud server application, NDTDATACLOUD, over mobile phone link allowing the office to access pile boring/concreting profiles and QA information and instruct the rig operator about new contracts. "Supported by multiple operating systems and on multiple platforms, NDTDataCloud enables customers to access their rig data from any global location and on any web-browsing device within minutes of a pile's completion." PL3000 monitors piling rigs during the construction of concrete filled piles. These piles are used to stabilise the foundations of buildings, where the pile is bored down to bedrock and back filled under pressure with concrete. The concrete must be pumped in under pressure and this is measured by calculating an oversupply, i.e. an oversupply of 20% means 20% more volume of concrete is pumped into the hole that the volume of the hole. Complete graphical monitoring package for CFA, OMEGA and Screw piling rigs. If you want a similar process management solution developing, please contact MEV Ltd.